This entry was posted on April 23, 2009 at 7:50 pm	and is filed under AKT, Merck. You can follow any responses to this entry through the RSS 2.0 feed. You can skip to the end and leave a response. Pinging is currently not allowed. Shouldn`t it be a 2H-[1,2,4]Triazolo[3,4-f][1,6]naphthyridin-3-one core? Thanks, I believe your correct. Revised structure should show now. 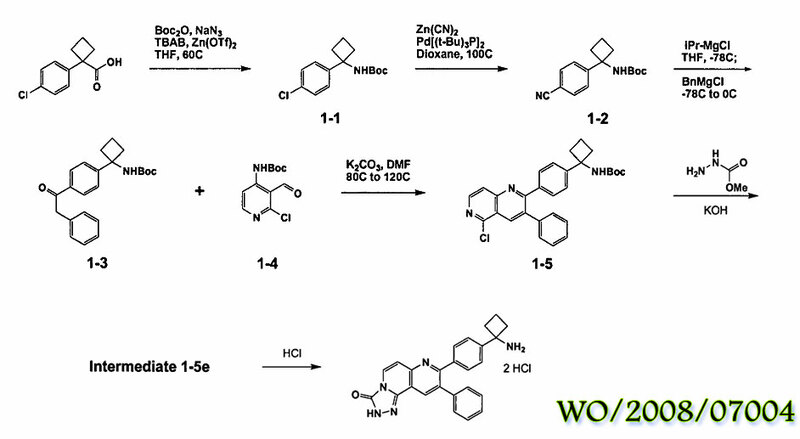 & Here’s a scheme for you synthesis junkies. Merck has been working on compounds like this for a long time. Did they ever show whether compounds in this series bind to other PH domains in other proteins? Are there any PI3K inhibitors available for research that are known to specifically and ONLY inhbit P110a? Is this soluble in DMSO?